The Oathtaking of Cirion and Eorl. The Unfinished Tales are just that. They are a compilation of additional writings by J.R.R.Tolkien on his imaginary world of Middle-earth, with introduction, commentary, index and maps by his son Christopher Tolkien. These additional writings cover events from the First, Second and Third Ages. 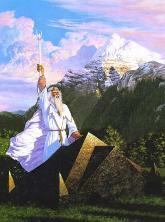 They add depth and detail to all three published works, The Silmarillion, The Hobbit, and The Lord of the Rings. This is a must read for the true Tolkien scholar. A Description of the Island of Numenor and The Line of Elros: Kings of Numenor: This is the only surviving account of the history of Numenor before it's downfall. The History of Galadriel and Celeborn: Here is all of the glorious background on the Lord and Lady of Lothlorien from their coming to Middle-earth at the beginning of the First Age, to their establishment of the Caras Galadhon and the Elven realm of Lothlorien. The Disaster of the Gladden Fields: Here is the story of death of Isildur and the loss of the One Ring. Cirion and Eorl and the Friendship of Gondor and Rohan: Before there were Aragorn and Eomer, there were Cirion and Eorl who formed the first alliance between Gondor and Rohan. Here is the story of the establishment of the bonds of love, friendship and loyalty that bound the two Kingdoms of Men in Middle-earth. The Quest of Erebor: Did you know that Gandalf actually sent Bilbo Baggins on his adventure with Thorin Oakenshield and the Dwarves in order to find the One Ring? Well, he did. Read about it here. The Hunt for the Ring: Learn about the Journey of the Black Riders from the time when they left Minas Morgul until they reached the Shire. Discover the devious workings of Saruman as he pursued the whereabouts of the Ring, as well as Gandalf's discoveries of the treacheries of the Wizard of Orthanc. The Battles of the Fords of Isen: Here is the riveting account of Saruman's initial attack upon Rohan, the ambush and death of Theodred, son of King Theoden, and the desperate sorties that preceeded the Battle of Helm's Deep.